Did you know a phone call to Children’s Aid can prevent abuse? 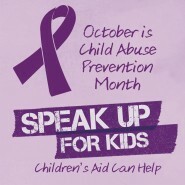 October is Child Abuse Prevention Month and this year the Ontario Association of Children’s Aid Societies (OACAS) and the Halton Children’s Aid Society (Halton CAS) will highlight how calls from the community play a vital role in preventing child abuse in Ontario. Last year over 171,000 Ontarians reached out to Children’s Aid with concerns about the safety of a child, an indication of the extent to which the community safety net is working. In Halton, we received over 4,400 requests for services and completed over 2,000 investigations.